When encountering electrical issues in your home or office, it's best to hire the services of an electrical contractor to solve them for you. Correct and secure electrical wiring of your home and or office is vital not only to protect your electronic items but to also ensure the safety of the people who use them. This is an area that you need to get right the first time. There are many qualified and reliable electricians out there, you need only find the right contractor for your budget. There is no standard pricing of electrical services among electricians. Rates vary depending on regions, complexity of given task, labor costs, etc. That's why it's important to obtain at least three electrical estimates. Acquiring multiple estimates from different electricians in your area is the best way to distinguish reasonable rates from overpriced services. An electrician’s job begins with a blue print of the area that needs to be wired or refurbished. He/she will then study this blue print and list out all the work that is needed to be done. A professional electrician will then compare the blue print to the physical area and underline any breakages that need to be done to walls etc. in order to run the wiring efficiently. A comprehensive electrical contractor will install, test, repair if necessary and even offer to give you a maintenance package. They will also follow local and national building codes when they install wiring and circuit breakers. Electrician labor rates will therefore depend on the amount of work to be done, broken down into the areas mentioned above. Have electrician quote your project Today. 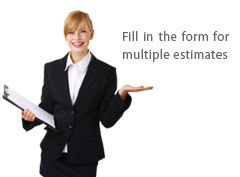 Submit the form on your right to receive multiple estimates from electrical contractors near you. Provide electricians a comprehensive list of all the work you want done and the time line you want it done in and ask each contractor to forward you an estimate. There are some electricians who will give you an “over the phone quote”. While these quotes are most often ok to work with, there are times that these quotes are not very accurate and the price seems to escalate in midstream. This leaves you hanging with a huge bill that you didn’t bargain for. Therefore, it is always a good idea to get a quote once the contractor has taken a look at the premises. Fair electrical prices are at your reach. Electric quotes not only help consumers approximate their final bill and avoid unforeseen expenses, but also enable us to make a calculated decision on which contractor to hire for the project. Next time you need to hire an electrician don't forget to obtain at least 3 electrician estimates to ensure that you pay a fair price.The most important aspect to keep in mind is that you must always hire a qualified electrical contractor. Always check for licensing before hiring an electrician. Cutting corners on jobs like this will only leave you with having to pay more in the long run.